Cherry Red Casino is one of the best online slots casinos to play at online, due to its generous deposit bonuses and large variety of slots games. It also has one of the most aesthetically pleasing software lobbies, which manages to look good while remaining functional. Many online slots casinos can manage neither good looks nor usability, so Cherry Red Casino is really ahead of the pack in terms of software design. 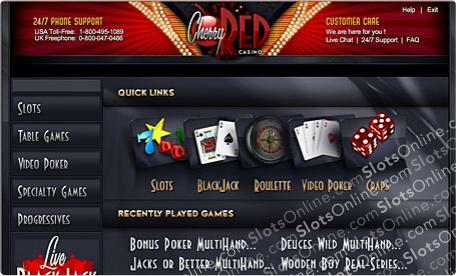 Cherry Red Casino uses the Real Time Gaming software platform, which contains a great number of slots games. They cover a wide range of different slots types, from traditional 3-reel slots to 5-reel video slots and progressive jackpot slots. You can potentially win hundreds of thousands of dollars on progressive slots at Cherry Red Casino, such as the Mid-Life Crisis slots or the I.R.I.S. 3000 slots. Another great thing about Cherry Red Casino is that it features a selection of licensed slots and many different video poker varieties. The Three Stooges slots can offer big paydays and a trip down memory lane. A range of classic video poker variants such as Jacks or Better, Deuces Wild and Joker Poker give slots players an opportunity for skill to play a bigger part in their gaming. Unfortunately, Cherry Red Casino does not focus on slots tournaments, preferring instead to offer live blackjack tournaments. This may not appeal to pure slots players, but players who like to mix it up a bit and play table games from time to time may find that this is a feature that provides good value. The live blackjack tournaments are played against other players, and they can cost very little for entry compared to the prize money on offer. An advantage that live blackjack tournaments have over slots tournaments is that they take a lot less time to be resolved, so you shouldn't need to play for very long to reach a result. The bonuses at Cherry Red Casino are some of the best in the business. General players can get 100% welcome bonuses worth $777 over their first two deposits, while more dedicated slots players can receive a 400% bonus worth up to $2400. Also, video poker players can get a 200% bonus worth up to $1200 specifically for video poker play, so all sorts of slots players can benefit from the deposit bonuses at Cherry Red Casino.